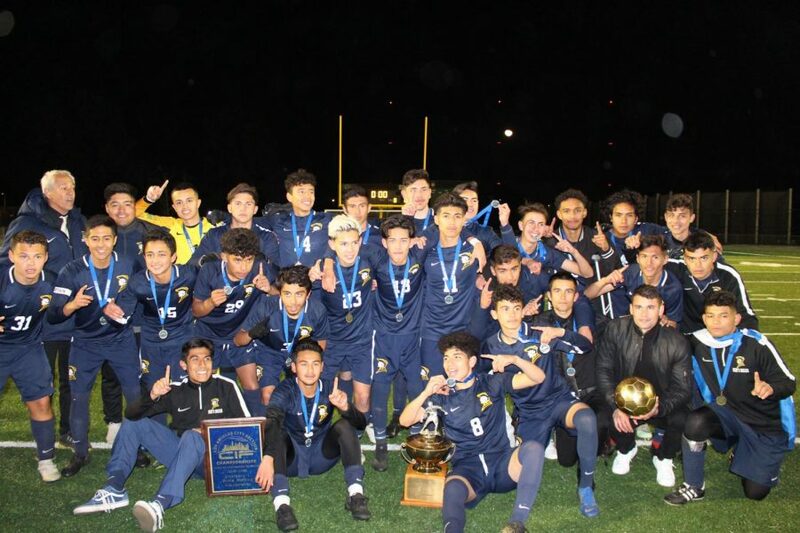 The BCCHS Soccer Team after winning the 2019 City Championship. The boy’s soccer team at Birmingham Community Charter High School is very competitive and the team always aims to win the city championship ring. They expect to win all the time and nothing less as the Patriot soccer team has won the city title three times in Birmingham soccer history–all with coach E.B. Madha, who has been coaching soccer at BCCHS for 18 years. This season was amazing because the team finished first in league, and this earned the Patriots home field advantage during playoffs. The varsity captains are seniors Noel Ortega, who previously played for the U.S. Soccer Developmental Academy, and Julio Viguera, who has been on the soccer team for all four years. Noel scored 23 goals during the season and playoffs. With many talented players on the team this year, BCCHS won another city ring. They were dedicated to winning it all and they got it. Coach Madha added another championship to his record and he now has 3 rings in 2006, 2014, and 2019. 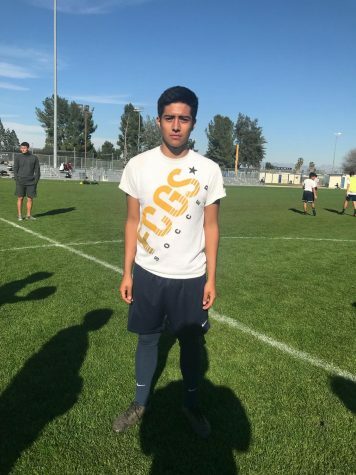 The journey all started in ninth grade for Viguera as he first tried out for the boys soccer team. His goal since the beginning, as well as other players on the team, was to win the Division One City Championship. All his hard work, as well as the support and determination of everyone on the team, all paid off on February 22 when the soccer team won the city championship played at Valley College Stadium. They defeated San Fernando High School 3-0 in a very competitive and interesting city final championship game. The goals for that match were scored by Charlie Cazares, Anthony Miron, and David Diaz. Julio Vigueras the varsity co-captain of the soccer team. The varsity team is composed of a variety of class grades, compared to previous years, when the team was mostly juniors and seniors. The team is now more diverse when it comes to the athlete’s class standing. The team consists of club players, which means they are playing at a high level of competition outside of high school. The varsity team depends on the young talent for their speed, skill, and discipline. Every aspect of their team features a young student who is attacking or defending. Some of the scores of the featured season games were: a 5-2 win against Taft, a 4-2 loss against El Camino, a 6-0 win against Granada Hills, a 7-0 win against Chatsworth, and a 2-1 win against El Camino. They made it into playoffs and faced Poly High School for their first playoff game. They beat Poly convincingly 5-0 in the first round and then beat Marquez in a tight battle, 2-1. In the semifinals against a tough Cleveland team, the Patriots won in powerful performance 4-1. They had lost in the first round of playoffs for the past two years against Sylmar High School. The Birmingham soccer team was finally able to get revenge by winning four times in playoffs and winning the city championship. Noel Ortega, varsity co-captain, exhibiting his fast pace skills. 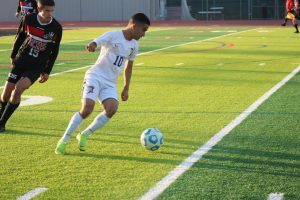 Noel Ortega and Julio Viguera, the varsity captains, gave us their opinion on the team’s performance and their overall experience playing for their school this year. This city ring is very important because they haven’t won the city ring since 2014. They are happy to win since it was their last year that they’ll be playing soccer for Birmingham High School. We interviewed both senior varsity captains before they won their ring and they seem to be motivated and hard working. We asked what motivated them to give it their all for their team. The varsity soccer team at their last game. 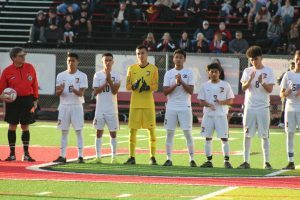 Now that the season is over, Birmingham can proudly say that the soccer team overcame their obstacles and beat the odds. The team can finally claim their victory by the medals that represent all the hard work and perseverance they demonstrated.